If you’re potty about puppies, you’ll love Barbie and her Sisters in a Puppy Chase! 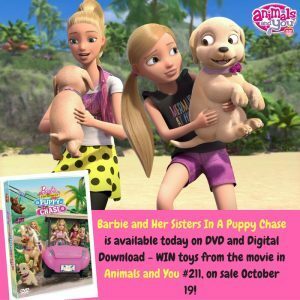 The new Barbie movie is on sale on DVD and Digital download from October 10, and it’s packed with adorable puppies and a tail-wagging good time! Get your paws on the next issue of Animals and You, on sale October 19, to win some gorgeous prizes from the movie’s toy range! Sooo cool! WIN Tickets To See Shrek’s Adventure! The Secret Life of Pets!